So much of what I adore about vintage items lives in the story they tell. If I am buying from a thrift store or antique mall…I get to wonder about the past owner and imagine the story that goes along with the item. If I am buying the vintage item from someone who actually owns it, then I get a real story about the item’s history and past. I love both these scenarios! Christmas is a time when many people traditionally put out and enjoy the only vintage items they own- ones from past Christmases! 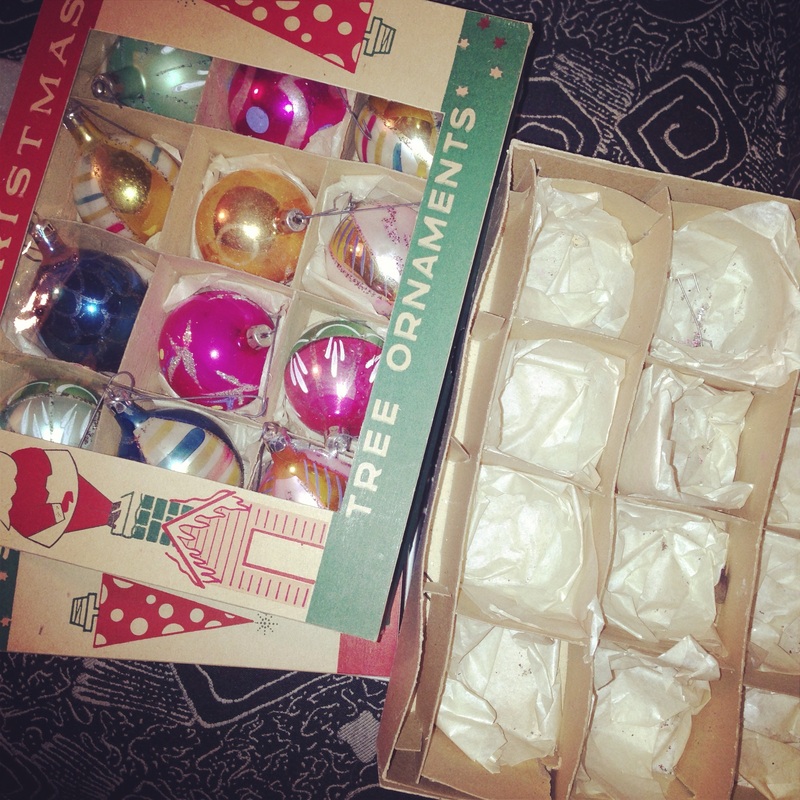 This makes Christmas extra special and fun for vintage lovers I think. 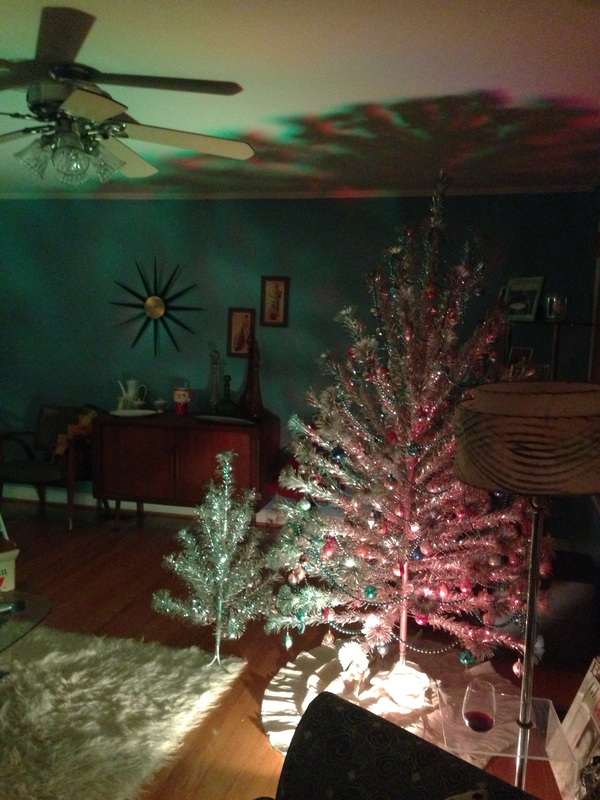 When I moved into my 1956 ranch last year, it seemed only natural that we should have a period specific aluminum Christmas tree, complete with color wheel. 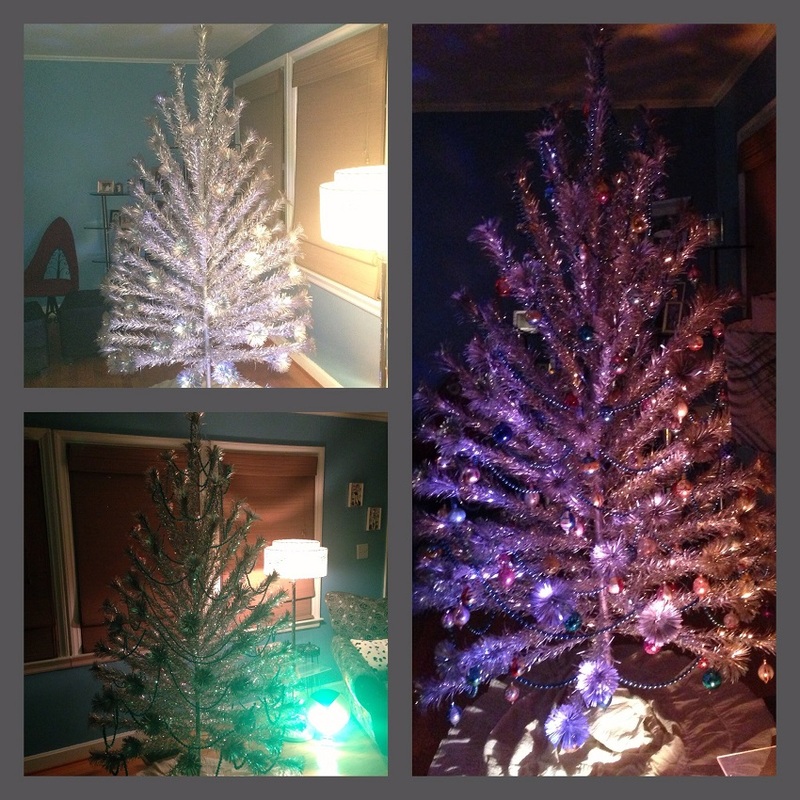 Just as an aside, because aluminum trees are aluminum, they are conductors of electricity and not safe for use with lights, thus the birth of the color wheel! I started my big search and realized this may not be an easy find and according to what I was seeing on Ebay & Etsy, it may be expensive! Didn’t I feel lucky when one popped up in a nearby town on Craigslist last! I couldn’t wait to see it, so I happily traveled about 45 minutes to view the item. When I got there I found out that the tree was being sold by a man who was cleaning out his mother’s estate. This had been one of their Christmas trees growing up-the one she used for their sunroom, he said. To my personal delight, it had been pristinely kept in the original box, with the adorably written and illustrated midcentury instructions still intact and each aluminum branch still in it’s original brown paper sleeve. The color wheel worked, even though it’s original box was long gone, it too had been kept with obvious loving care. I was over the moon! The gentleman also told me he’d throw in all of her decorations for that tree if I was interested. How could I resist–to not buy them would be like splitting up siblings! 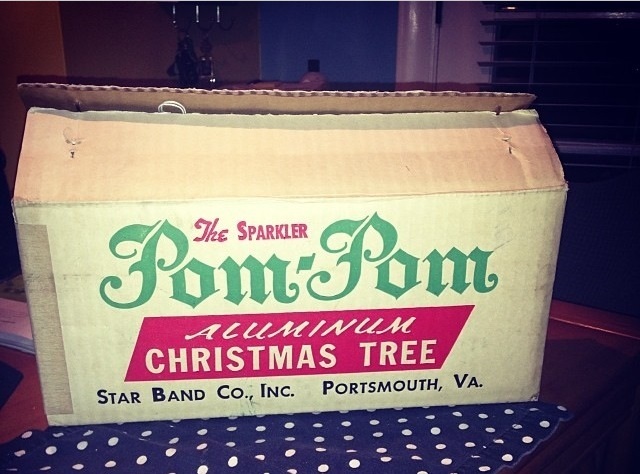 I left that day with a 7ft Sparkler Pop Pom Aluminum Christmas tree with color wheel, 13 boxes of beautiful vintage ornaments and a blue mercury glass garland-I couldn’t believe my luck. And bonus- it came with a vintage tree ‘skirt’ that is actually a handmade strapless vintage slip! I love this tree so much that both this year and last year I actually put it up before Thanksgiving, much to the horror of many of my friends- but ahh, I don’t care! I want to enjoy it and give it some time in the house; the man I bought it from told me that his mom had been sick for several years and hadn’t put it up for that last 5 so I figure it’s like making up for lost time. Each year as I put up the tree and unwrap the ornaments I think so fondly of the original lady of the house who took such sweet care of this tree and her family and I feel a real responsibility to carry on the tradition. This year I happened up on another Sparkler Pom Pom at my favorite antique mall in Charlotte Sleepy Poet. This one was a sweet miniature 3ft version of the tree I already have, but it was found at an estate sale in the original box, unopened! How could I resist this? So I bought this one too- it was a great price- and I just can’t help but wonder who about the story for this little tree: who originally owned it and why o’ why didn’t they ever put it up? Did they get it on sale one year and forget about it? Did they have a house with a bunch of aluminum trees and this was just an extra? Or, did they watch the Charlie Brown Christmas special in 1965 and decide, like many people, to only have a real tree from then on? I’ll never know, but I do enjoy thinking about it. 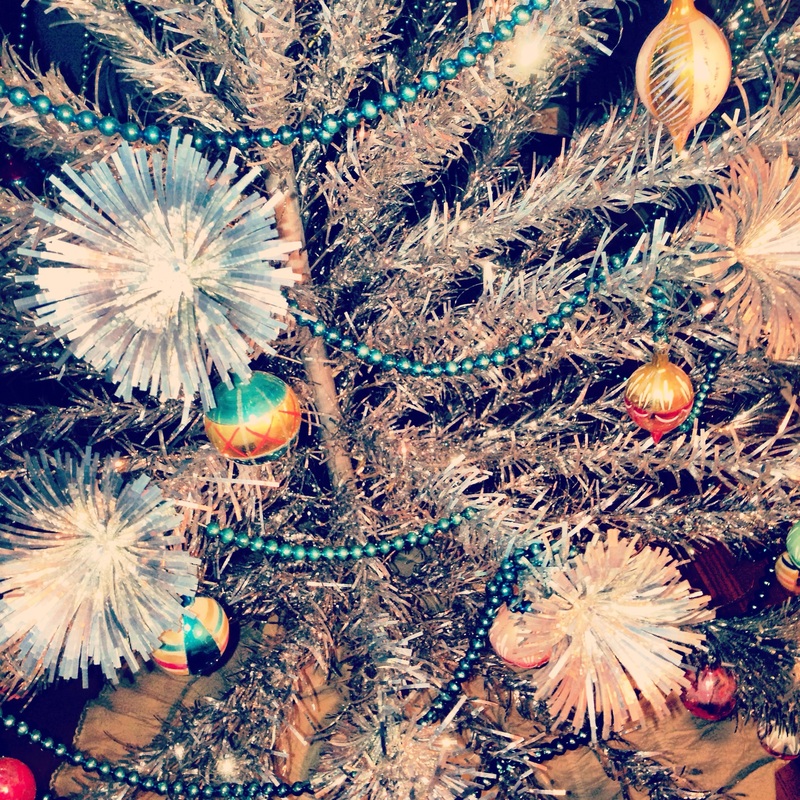 I used some of my vintage ornaments from my 7ft tree and of course it’s adorable. It does need it’s own color wheel though…. 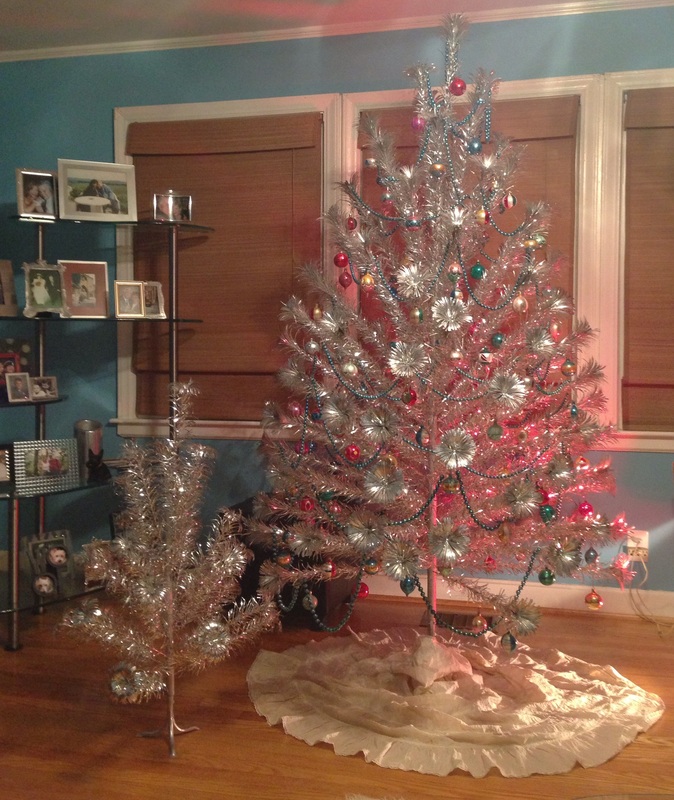 Check out this link on Etsy to learn more about The History of the Aluminum Christmas Tree.